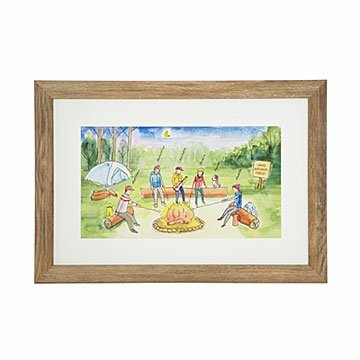 Celebrate your unique, outdoorsy family with this personalized art. Celebrate your unique, outdoorsy family—bring along the guitar, roasted marshmallows, and beloved pet if you like—with this personalized art. For each print, Patricia Carlin illustrates the details that define your tribe: hair styles and colors, skin tones, outfits, props, and a campground sign featuring either a memorable location or your family name. 3-12 figures. Illustrated in Pennsylvania. Printed and framed in Oregon. We purchased this insanely cool personalized piece as a class holiday gift for our backpack-loving teacher who has 4 adoptive children and two biological children. As with any blended family, it's so important to re-affirm unity in diversity. This piece was perfect for that! The proof process was easy and specific. Delivery was timely, and the piece is just incredible! We cannot wait to gift it next week right before the holiday break. Thank you UG! This was a very frustrating journey to the correct print. I put all my selections in, got the proof email, clicked "no" not correct, but then realized I did not have time to write all the things that needed to be corrected, so went back a couple of days later and clicked "no" in the original email only to read, "Your proof has been submitted as correct." I called, talked to a wonderful customer service agent. He helped get everything right, then I got a second email with another proof. Still wrong, but by that point it was too late and I got the wrong print in the mail. I called back, talked again to a wonderful customer service agent. Finally all was correct and it arrived in the mail correct. Great product, long journey to get it right. This painting is perfect. My mom was amazed at how the people truly looked like our family. I needed to make an edit after I submitted my order and had received the first proof and within 24 hours the edit was made. Frame and artwork were both high quality. My daughter and son-in -law loved the gift and immediately hung it in a prominent place in their home. Beautiful personalized artwork that captures the family. The ability to personalize each picture makes it a great gift for family and friends. Beautiful in any room of the house. We gave this as a unique gift for my parents lake house from the grandchildren. They loved it and have gotten lots of comments since hanging it in their foyer. The kids enjoyed picking their clothing, hair styles, and accessories. It was a very personalized gift that my mom loved! I ordered this item for my husband as a gift for his first Father's Day. It was perfect!